Skipper Ben Mee has laid down the importance of manager Sean Dyche’s decision to commit his long-term future to the club. 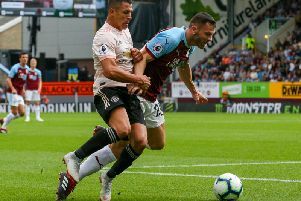 The Burnley boss, who penned a four-and-a-half year contract at Turf Moor last month, has taken the Clarets on a voyage of discovery since succeeding Eddie Howe at the helm in 2012. Away from the field Dyche was the visionary leader in the development of the state-of-the-art Barnfield Training Centre while on it the club are on course to complete their highest finish in 43 years. Mee has been a part of the journey since the beginning of Dyche’s reign, taking in two promotions from the Championship as well as securing Premier League survival to cap it all off. Ahead of the trip to the Liberty Stadium, where the Clarets take on a rejuvenated Swansea City, the centre back said: “It’s brilliant for everyone, with the amount of change there has been since he’s arrived. “We’ve taken the club to a new level since he’s been here and it’s fantastic to see the growth at the club since I’ve been here. “He’s signed a new deal with all the noise going around so it’s fantastic. Mee added: “We’ve come a long way, I’ve grown as a player myself and we’ve had some exciting and enjoyable times. “You have to try and build on everything you can and keep going. It’s important to keep moving forward.